A Virginia Pizza Hut employee was fired after writing an off-color joke inside of a pizza box that the customer found to be too saucy and inappropriate. The customer, who declined to be named publicly, said that her two sons, ages 12 and 15, asked for a joke to be written in the box when they placed the food order online in Stafford, WJLA reported. 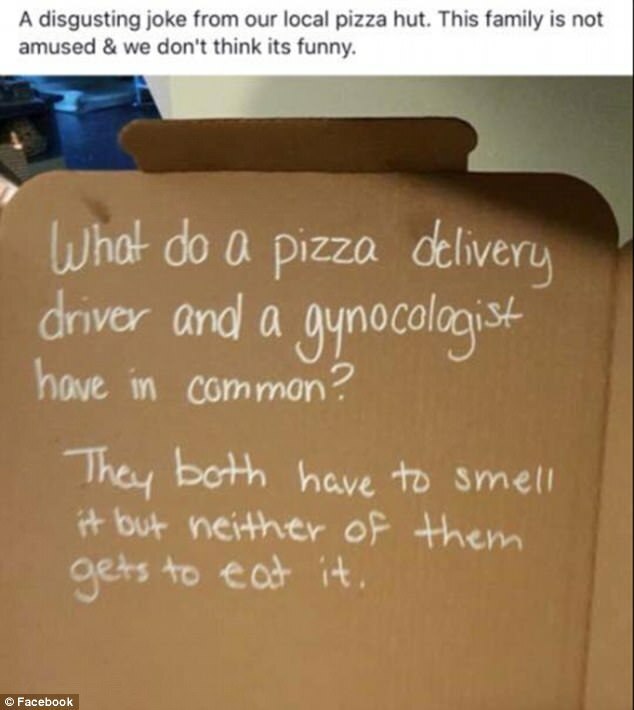 'My son ordered a pizza online and under the special instructions he requested a joke,' she explained. One of the workers at the Jefferson Highway location followed the instructions for the online order, but the joke left the family in shock. The mother-of-two was extremely upset by the joke, and posted a photo of the box on social media. She has since received bullying and angry messages from people over the worker being fired. The employee who wrote the joke called the woman to apologize. The customer said that she hoped the worker would not be fired, but management at the eatery axed the delivery driver anyway.